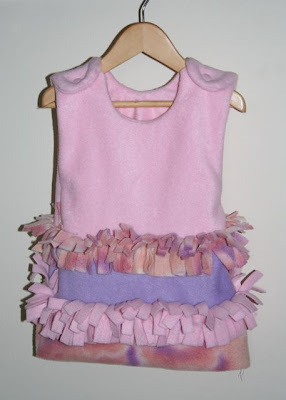 With the mountain of snow still lurking outside, here's a quick how-to for a fun little fleece dress to stay cozy for the rest of the winter. Obviously measurements vary, so I recommend using a sleeveless top/dress that fits & trace it for the neck and armhole shape and then extend with an A-line shape, then split into three sections. 3. Cut 4 strips for fringe, making each double the length of the seam they will cover and 2-3inches wide (depending on how long you want the fringe, mine was 3"). 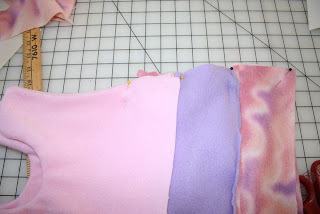 Sew a long baste stitch down the center and then cut in every 1/2in on both sides being careful to stop cutting just before the basting. 4. 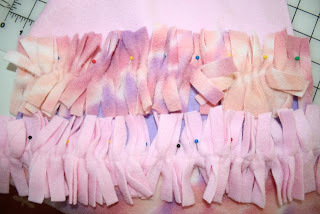 Pull thread ends to gather fringe and pin in place on front & back pieces. Stitch over basting. 5. 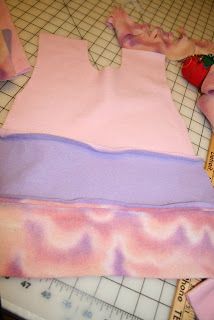 To add the lining, put right sides together of the top front parts and stitch all the way around except for the bottom. Do same for back top parts. Turn right side out. 6. Putting front & back right sides together pin from bottom of armhole to hem and stitch side seams. 7. 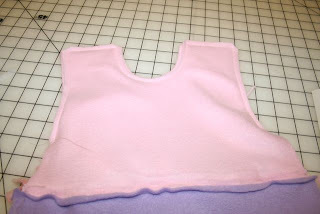 Turn right side out & attach closures for shoulders. I used snaps, but buttons or velcro would work. Enjoy a cuddly little outfit! I love this thanks for sharing! Just stopped by from SITS; hope you do the same. Loved the hairdo hats! Awesome and clever! Thank you so much for linking up with the Talented Tuesday link party at My Frugal Family, which is hosted every Tuesday. Please feel free to stop back in every week and post your newest projects! That is so cute and soft! love it! Sew cute! Will have to try it! From Follow Friday. Come visit! Too cute! I found you on Friday Follow! I wish I could sew, but I can't.. this is soooo cute.. Great job.. Thanks for joining Get Your Craft on Thurs. Please join me again next week for another great party. Oh it looks so cozy!